My discussion about ‘Feeling’ (July 2015), was prompted by a Talk I went to during Bristol’s Big Green Week in June where we looked at work done by Rudolf Steiner (1861-1925) on ‘The Virtues of the Human Heart’. Human Virtues seem to have also been discussed by other Thinkers such as Goethe (1749-1832), Aristotle (384-322 BC) and more recently by a Bolivian spiritual teacher Oscar Ichazo (born 1931), who developed the Enneagram describing personality types based on 9 Virtues (as inset). Ichazo calls them “essential qualities of the awakened heart”. He suggests that these Virtues are not achievements to be attained or practised but are our natural state when we embody our innate Essence, our True Self, our Spirit. He also suggests that if we lose touch with a Virtue, it may become our passion to retrieve it. Virtues and the Human Heart – By definition, Virtues are ‘desirable’ qualities and so suggest that we, as Humans, do not naturally behave in this way. 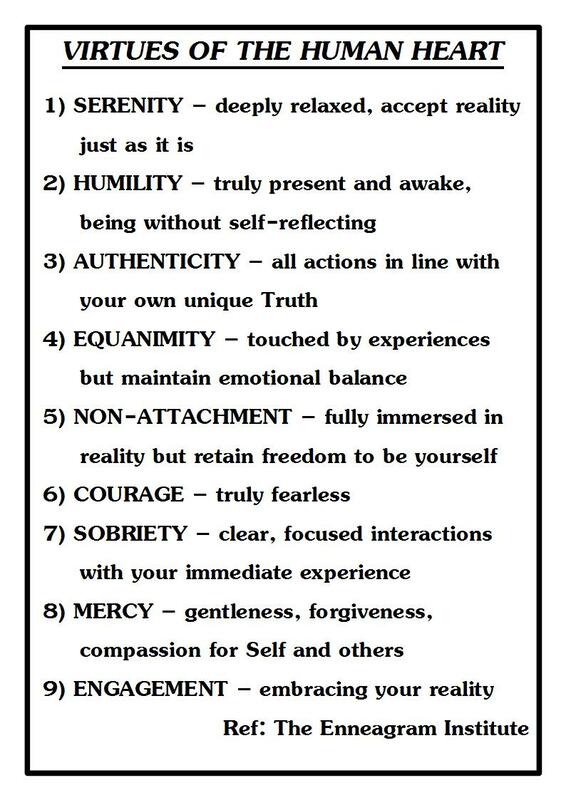 In Healing terms from my perspective, all these virtues begin to manifest when your Energy Field begins to focus and you begin to feel re-empowered as your own person… then these become a more innate way of Being… no thought, no effort, just is.